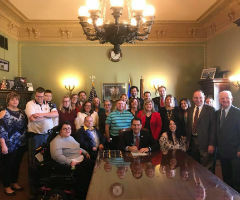 DRW thanks legislators and the Governor for their support of people with disabilities in passing legislation that will help people with disabilities lead full, integrated lives in their communities. DRW looks forward to working with the Department of Health Services, the Department of Public Instruction, and the Department of Workforce Development in implementing the law and enacting these policies to improve competitive integrated employment opportunities for Wisconsinites with disabilities. Disability Rights Wisconsin is the federally mandated Protection and Advocacy system for the State of Wisconsin, charged with protecting the rights of individuals with disabilities and keeping individuals free from abuse and neglect.